There are all kinds of family keepsake designs you can make using jewelry and craft supplies. For example, birthstone jewelry is a perennial favorite. Or see links below. But I also love this shrink plastic hand print key chain charm tutorial by Hayley over on Grey House Harbor. 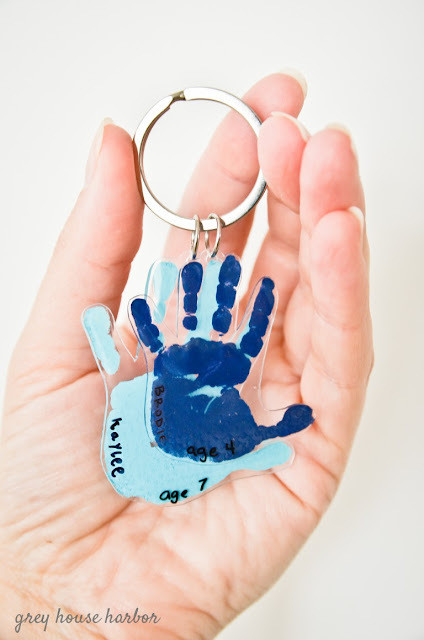 These hand prints are far easier to carry than if you made the plaster of paris mold variety of the hands of family! Also consider hanging these on the window pane. As it is shrink plastic, you can make several very quickly - enough for other members of the family!